Nintendo is pleasing legions of fans with yesterday's announcement that two fan favorites are getting their own games and that they will be arriving sooner than later. Yoshi's Crafted World is an adventure game starring Mario's pal Yoshi and it marks the first time the little guy gets his own Switch game. Players take the role of Yoshi and explore "a big world crafted from household items like boxes and paper cups, journeying through each themed stage to solve puzzles and find hidden treasures". Oddly, players can also experience the each stage backwards for a fresh perspective while looking for Poochy-Pups. 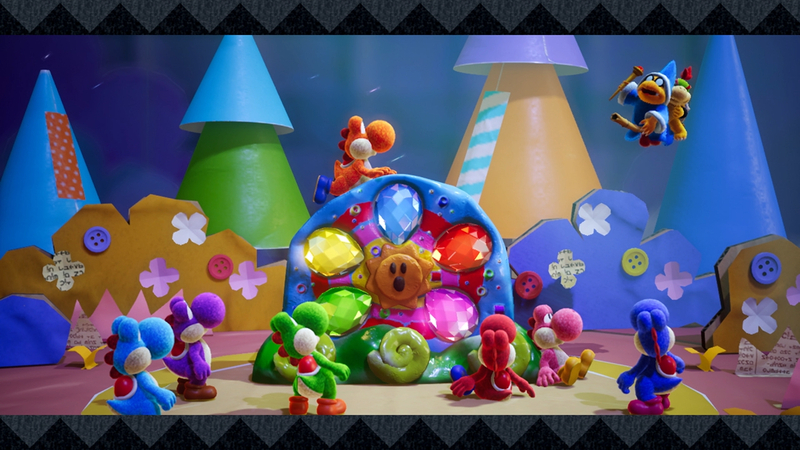 Yoshi's Crafted World also features 2-player cooperative mode. Look for the game on March 29th. Kirby's Extra Epic Yarn is coming to Nintendo 3DS on March 8th. "In this enhanced version of the acclaimed Kirby’s Epic Yarn game that originally launched for the Wii system, Kirby is transported into a world made of cloth and yarn to unravel enemies, unzip secret passageways and transform into powerful vehicles. Every stage in the original Wii version is stitched in, but this Nintendo 3DS version has some new features, like Ravel Abilities that power up Kirby in fun ways, new mini-games featuring familiar faces King Dedede and Meta Knight, new furniture to personalize and decorate Kirby’s Pad, and a new Devilish mode that adds an extra layer of challenge to each stage."